Situated in the middle of the village is this old house, but with all accessories that make you comfortable. The building is traditional. In the basement of the pension there is a village museum where you can find all the local specifics (pottery, costumes, tools, etc.). It is quite an isolated place, where people still use the traditional tools for farming and animal breeding. 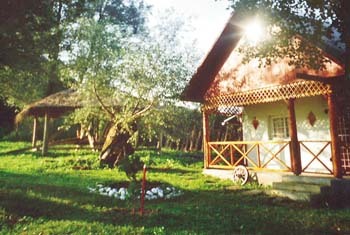 There are ten wooden bungalows for four to six persons, large garden with fruit trees. There is one brickhouse providing accomodation for 9 people. Also it is possible to camp in the garden. The pension as well as the owners are very hospitable, they serve excellent food including all the local specialities (pork, chicken, beef, fish or vegetarian upon request). The house has a nice garden with flowers and vegetables and in the courtyard there are chickens so the tourist can consume fresh eggs. The owners organize a picnic-day, a trip to the wonderful Bekecs mountaines, herb tours, where you come to know all the main medicinal herbs of the region. Since the area is rich in water, the locals used to fish a lot. Nowadays fishing waned, a lot of them work in Targu Mures or in the local industry. But it is still very well possible to fish here. The other nature lovers will have the pleasure to see many species of wild flowers, butterflies and mushrooms.